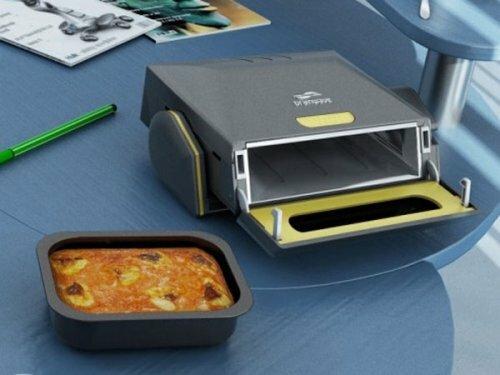 If you spend a ton of time at your desk, the Desktop Microwave would be perfect for you. Sadly, it’s just a concept at the moment, but if it ever becomes real you won’t have to ever leave your desk again. The Desktop microwave comes from the mind of designer Steve Gates, who’s life goal is apparently to make everyone fat and deskbound, with a taste for microwaved food. Oh, wait. Isn’t that the America we know and love? Looking for something new in a microwave? 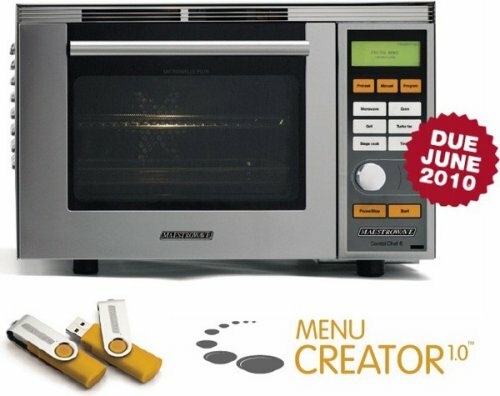 Well, these combi-ovens are pretty popular in Europe, because they are a bit more versatile and they look good. They offer up a USB port and menu-creating software. The kitchen will never be the same now that you can program the mode and time of cooking for your favorite meals and store them on a USB drive. But what we really want to know is, will it charge our gadgets or not? A couple of boffins from Japan’s Keio University didn’t have enough YouTube in their lives, so they have developed a microwave aimed at other geeks just like them. I’m talking a YouTube-powered microwave. Because heating up those hotpockets can get boring. The “Castoven” is based on a conventional, unbranded model of “good quality” and features a 10.4-inch LCD screen in the door panel and speakers. It’s connected to a Mac, but could easily work with Windows computers as well. Convergence is a great thing in the gadgets we know and love today. For instance the iPhone is a great converged device that can replace a GPS system, phone, MID, and MP3 player with one device. Convergence is usually associated with technology products, but not always. A converged refrigerator is now being offered by a company aptly called MicroFridge. The device combines four things that the average college geek needs to make life livable. In one device you get a fridge, freezer, microwave, and a charging station for your gadgets. 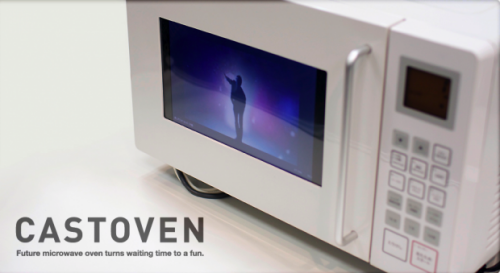 We first showed you the Beanzawave USB microwave last month. Well here’s the first hands on video of the Beanzawave in action. Sure,when it comes to power and size it’s lacking, but it makes up for those cons with portability and convenience. It’s powered by onboard batteries that can be charged via USB or an AC adapter. Of course, it’s designed to work with Heinz’s very own single-serving cans of Chef Boyardee foods. We still don’t have any details on pricing or availability. 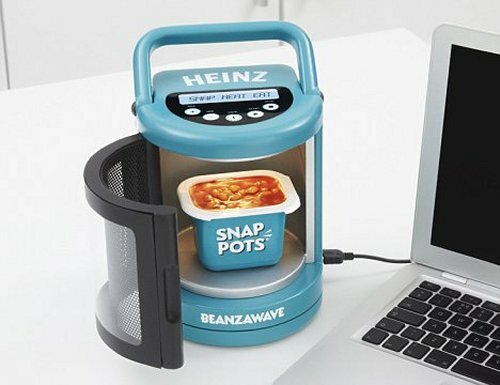 From American food company Heinz comes this Beanzawave portable microwave. 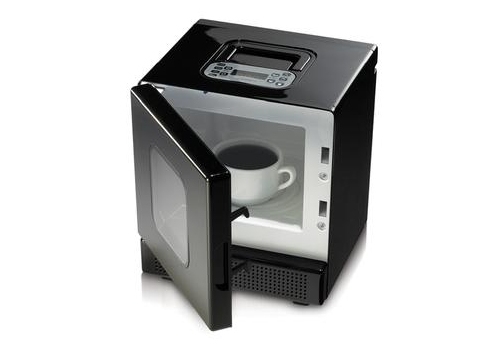 It’s the world’s smallest, portable microwave oven, measuring 7.4 inches tall x 6.2 inches wide x 5.9 inches. It’s only a prototype at the moment. The price would be around $160 if Heinz ever decides to make this USB microwave oven, so you can have your beans anywhere. (What were they thinking with that name?) It would be convenient for those on the road since it can be powered it by a laptop. Microwaves are boring. They all look alike. They’re just plain, boring boxes that magically heat your food. There is no iPhone of microwaves. But if you want to spice up that bland food box, help has now arrived in the form of Microwave Stickers. 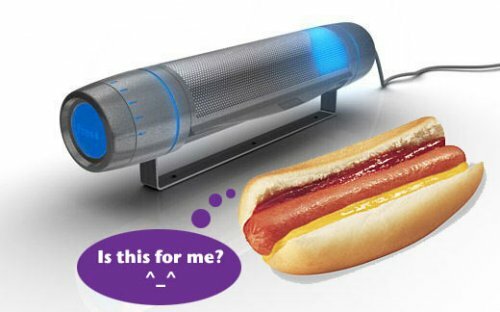 They come in a variety of patterns and make it seem like you have a cool new appliance. When you get sick of it, just put a fresh sticker on top of the old one. I for one want nothing more in life than to have some fish swimming on my microwave. This microwave is for serious pizza lovers only. It makes reheating pizza easy. It’s a microwave oven with a built in pizza oven drawer underneath. 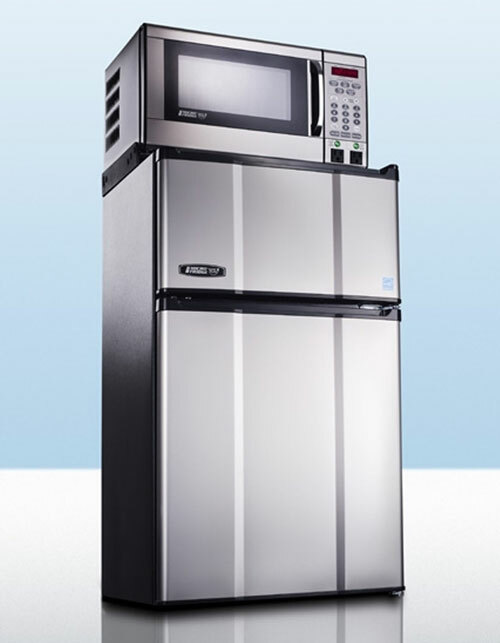 The Stainless Steel Kenmore 1.1 cu. 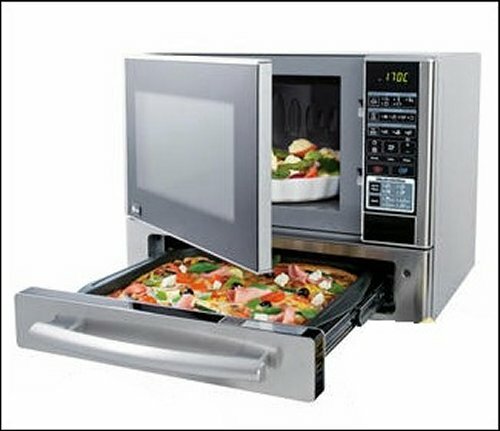 ft. Countertop Microwave & Pizza Oven with a Pizza Drawer Underneath has all of your standard microwave features. It’s good to go with the usual popcorn button, defrost, reheat, etc and has several pizza reheating buttons. When it comes to pizza reheating there are four different temperature control settings and a button for each type of crust: Frozen Rising Crust, Frozen Regular Crust, Fresh Regular Dough, Fresh Par-baked Crust. Christmas is almost here and it’s time to celebrate. And by celebrate, I mean let’s watch a bunch of Microwaves, 49 to be exact, play “Jingle Bells” with their timer bells. Of course, the timers all had to be set manually, but they did a good job considering. I picture this 49 microwave contraption rigged to the chimney somehow, as a Santa alarm. It could go off just as Santa is entering your home and cook him up some nice quick meals at the same time. He’ll surely reward you with an extra present or two. I for one thought that we had all the distractions we could handle behind the wheel. Apparently, there was one thing missing. That must be why Maplin introduced a portable microwave oven that runs on 12 Volts DC. Put this baby in the passenger seat and heat up your coffee and breakfast as you’re stuck in traffic. It’s kind of like carpooling with a cook. It’s probably really made for tailgating parties, but don’t let that stop you from ramming the car in front of you while you heat up the hot pocket of death. The Maplin Car Microwave is available now for about $180, which is a little steep. Might as well cook with gas at that price. 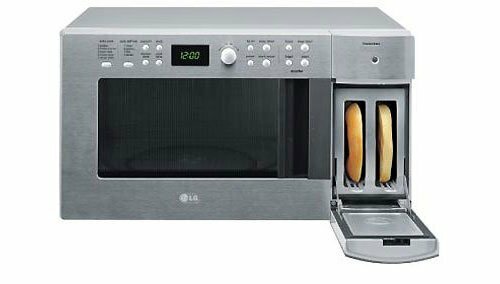 LG converges the Microwave and the Toaster. The device is not new, but it’s like a UFO sighting, you know they’re out there, but you’re still surprised to see one. Obviously it hasn’t caught on, which is odd because it’s a great space saver and it frees up an additional power outlet in your kitchen. Maybe it’s tough to clean or something. Anybody out there have one of these? Do you like it? It looks like a flashlight with a cord attached, but that would be silly wouldn’t it? Almost as silly as the microwave concept that it really is. It was designed by Martin Zampach, and this microwave is far from traditional. If your one of those types whose diet consists entirely of hot dogs, sausages, sticks of bread and the like, it would probably work out well for you, despite the fact that your heart is about to burst. I’ll stick with the traditional microwave, just a little while longer. 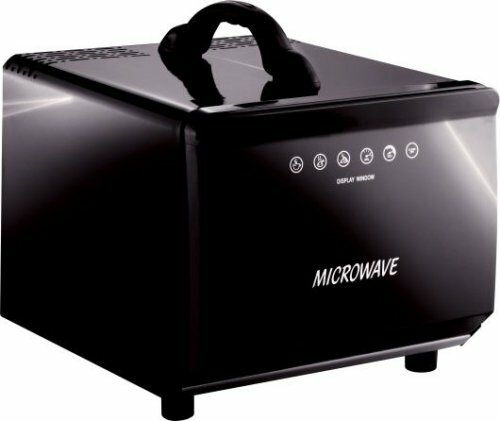 This little Iwavecube personal microwave is pretty self-explanatory. It’s measures just 10.5″x12″x10″ so it doesn’t take up a lot of room, but you aren’t going to be putting a big microwaveable TV dinner in there either. Have one of these at your desk and you avoid trips to the break room, keeping up your introvert profile and avoiding awkward conversations while your waiting for your stuff to heat. Unfortunately, unlike the USB Mini Fridge, USB power just doesn’t cut it for running the Iwavecube and it will require a standard outlet. And if your office is like ours and frowns on plugging in personal appliances at your desk, I can think of a number of other handy places for it like my TV room, home office, wet bar, in my car, etc. Here’s a clock for those who have no clock and a spare lemon tree in the backyard. 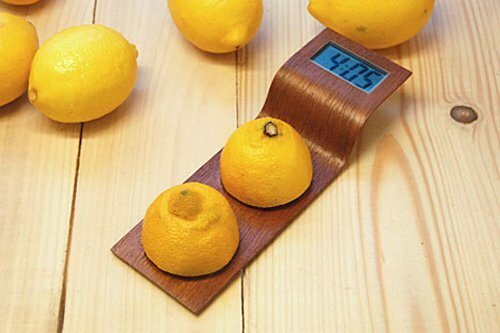 The tree will come in handy since this clock is powered by the energy of a lemon, which will power it for a week or longer. The design is intended to remind us that nature is still our direct energy source. When life hands you lemons and a lemon powered clock, most people would just make lemonade and get the time from the microwave. But some of us will put lemons on our clock, and through the sour sucking power of citrus, attract fruit flies until we give up this novelty clock design. Here’s an odd sight. 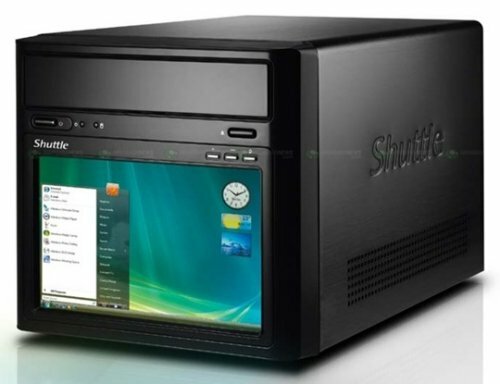 A PC with a built-in 7-inch touchscreen that looks more like a microwave or other appliance. We are used to bulky PC’s that have to be tucked under desks well away from your external monitor as if they are mortal enemies in some secret war. But now it’s as if the two are enjoying a nice soft cuddle, with the Shuttle D10. As you might expect, it only has a resolution of 800×480, so it won’t replace your current PC. Well, unless the one you’re using is reallllly old. But it might be a good PC for those odd places, like the kitchen, or in an RV or something. It will be available in Japan this week for under $500. I don’t think it’s a great idea personally. Did we not learn from TV/VCR combos?